EndoStim offers a novel treatment option which is designed to improve the function of the LES without significantly altering the anatomy of the patient or introducing mechanical constraints on the esophagus. A properly functioning LES typically prevents GERD symptoms from occurring without creating any adverse symptoms. Meanwhile, any damage to the esophagus (esophagitis) has the opportunity to heal. The EndoStim system consists of a bipolar lead which delivers low energy electrical pulses to the patient’s LES, and an IPG which is wirelessly programmed and can be adjusted to individual patients’ preferences and changing lifestyle needs. The device is implanted through a minimally-invasive laparoscopic procedure. EndoStim LES stimulation therapy has been shown to be safe and effective in reducing GERD symptoms and improving quality of life in most patients. The EndoStim system consists of a programmable implantable pulse generator (IPG), bipolar stimulating lead, and wireless Programmer. The IPG communicates with the external Programmer via telemetry, so stimulation is wirelessly adjustable by a clinican post-implant if needed. 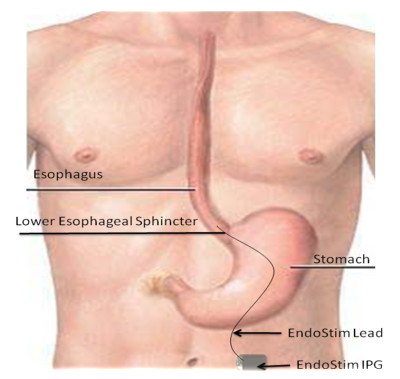 The EndoStim IPG is an internally-powered device that delivers electrical stimulation therapy to the lower esophageal sphincter (LES) using proprietary stimulation algorithms. The device battery is non-rechargeable, with estimated longevity of about 10 years under typical use. The IPG is programmable, i.e., its parameters and algorithms can be set by the attending medical personnel to suit the patient’s needs via wireless communication with the EndoStim Programmer. The lead electrodes are implanted on the LES through a laparoscopic procedure. The electrodes receive electrical pulses from the IPG, and deliver pre-programmed therapy to the LES without need for patient intervention. The Programmer communicates wirelessly with the IPG. Stimulation parameters can be adjusted post-implant in the clinic by a health care professional. The EndoStim system is CE Marked for patients with gastroesophageal reflux disease with symptom duration of six months or longer. The EndoStim system is contraindicated for individuals with significant cardiac arrhythmia, or ectopy, or significant cardiovascular disease; or patients who are pregnant or nursing.